Top 10 things you must eat in Bali, Indonesia (Surprise present at the end!!) - Must. Eat. World. Bali is a pick your own adventure kind of place, but you really have to know what you’re looking for. For some crazy partying you have to go to Kuta and Legian. Fancy some high end shopping, restaurants and hotels, head straight to Seminyak. Looking for the chilled out surf vibe, you have to go to Cenggu or Uluwatu. Yoga retreats and spas, Ubud is for you. Wanna take some diving lessons go to Nusa Lembongan or Gili T. And there’s a lot more. Choose carefully. Staying is wrong parts of the island can make for a miserable trip. check out this excellent post http://www.bali-indonesia.com/hotels/where-to-stay.htm# on where to stay in Bali. 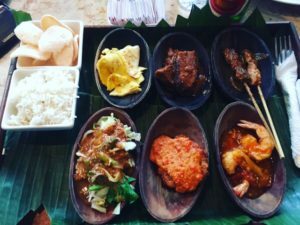 I am going to focus on some great Indonesian and Balinese food and where you should go to get some. Let’s begin. By far the most common Indonesian dish outside the country. So it makes sense that if you are here you should probably give it a go. Nasi means rice and Goreng means fried. 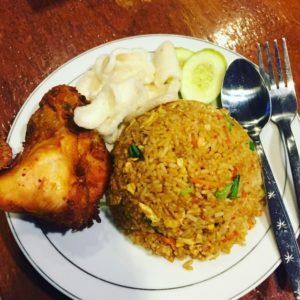 So its Indonesian fried rice cooked with chicken, egg and veggies or just veggies if you are vegetarian. Served with Prawn crackers on the side. You can find this in pretty much every restaurant in Indonesia. 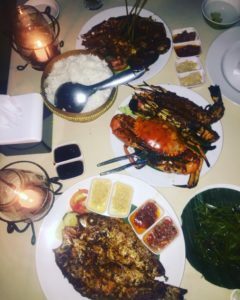 Want to try some local veggies, meat and seafood at the same time. Nasi Campur is for you. It’s a little bit of everything one a plate. One of the many Nasi Campurs i had had 19 different types of meat and veggies. This one is mostly for meat eaters. 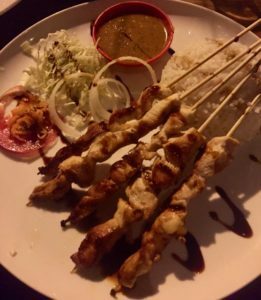 Indonesian satay is probably the most famous Indonesian dish. Usually some part of chicken or pork or beef charcoal grilled on stick. Marinated with some sweet and savory soy sauce. Killer mid-meal snack. 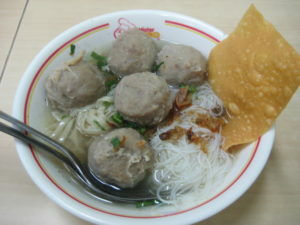 Meatball soup with noodles, fresh herbs and chicken broth topped up with some sweet soy and cilli sauce.The place to get some amazing bakso is stall right outside the north end of Kuta beach. If you’re a vegetarian, you’re options for local food are somewhat limited. But there is one dish you can always order at just about any local restaurant. 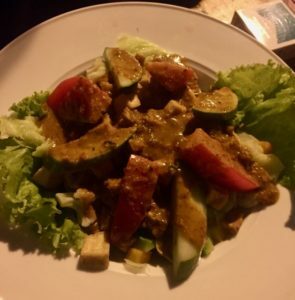 And that is the Gado-Gado, a warmish salad made with blanched or boiled vegetables with lots of peanut sauce. Simply put, Indonesian comfort food. Some kind of mixed vegetable soup found everywhere in Bali. 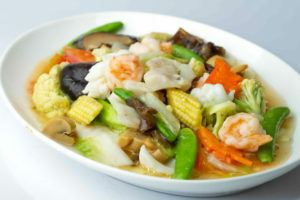 Cap cai usually has chicken in it, But you can easily ask for a vegetarian version. The best cap cai that I had was in Nusa Lembongan at Warung 99. This one is a little hard to find but very unique. Bubur is rice porridge served with fried chicken and some soy sauce. Feels like a pretty weird combination? It is. But it totally works. 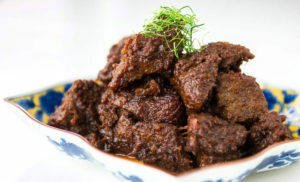 Rendang was rate the World’s Best Food by CNN in 2011. Is the world’s best food? maybe not. But it is damn right delicious. Slow cooked beef with coconut milk and a mixture of lemongrass, galangal, garlic, turmeric, ginger and chilies. Heavenly. And here’s the CNN list of World’s Best Food in case you were curious. Okay this is technically not a dish but a spicy paste to be added to grilled fishes and meats or to be had with plain rice. 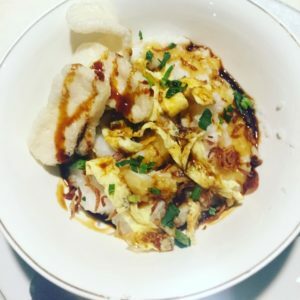 Made from a mixture of variety of chili peppers with secondary ingredients such as shrimp paste, fish sauce, garlic, ginger, shallot, scallion, palm sugar, lime juice, and vinegar. Every restaurant has it’s own version of Sambal. 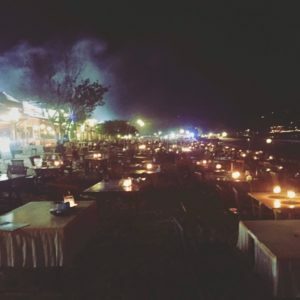 So you find yourself in Bali with a special someone. Heck even if you’re all by yourself. This is a must do dinner. A smalls stretch of the JImbaran beach is lined with seafood restaurants. with tables set up all the way to the water. Watch the sunset as you have an amazing meal on the beach. Time for the surprise present! It can be somewhat challenging to figure out what to order since the name are usually in Bhasa with no english translation at most Warung. I’m going to end this one by doing you a favor giving you a list of Food Translation courtesy http://blog.theholidaze.com/ . You’re Welcome! 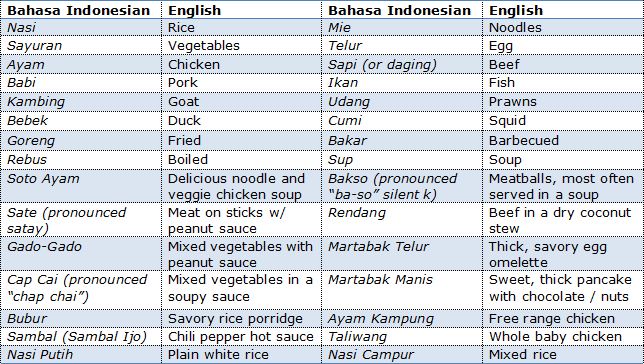 My Parents are visiting end of March for a week and this is going to be helpful, especially the food translation….